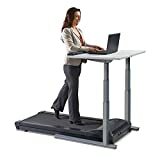 Standing treadmill desks offer people a great way to burn calories while working on their desks. This is a beneficial item that delivers two amazing benefits at the same time; burning calories and productivity. Standing treadmills don’t necessarily have to be attached to the desk. Most of them have slow walking speeds and adjustable heights to suit various working positions. In this post, we will help you select the best standing treadmills on the market. We’ve done our research based on consumer opinions, reviews, rating, and recommendations. These are the best standing treadmills of the year to give you a good value for your money. LifeSpan is great treadmill desk to start our list with a wide array of features. It is a complete unit with a treadmill and a desk surface area to get you started right away. The unit is compact and measures 68.5”x28.5” which is an ideal size for small homes. It uses exclusive internal cable management to direct the power cable to the floor for safety purposes. There are console readouts for walking time, distance, calories burned and step count. You can also track your progress over time by linking I to your LifeSpan app through a wireless sync activity data. Goplus treadmills desk comes designed with a large working surface area so that you can focus on your work while exercising at the same time. It is a durable choice sturdily constructed using high-quality steel frames. It has a weight capacity of 220 pounds and a long-running belt for more comfortable workouts. You can easily adjust the table height in five different levels to suit your ideal working height. A further easy to read LED display enables you to check speed, time, calories burned and a lot more. 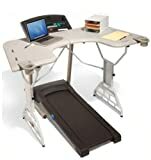 Overall, this is an easy to assemble treadmill desk that comes shipped in two boxes for the desk and belt. TrekDesk is an integrated desk and treadmill that lets you work while walking. 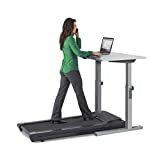 It is a great choice with a large workspace that measures 72 by34 inches and one that attaches to almost any treadmill. The desk comes with a manuscript holder, headset stand, and a three-level file holder. Adjust the desk with ease to suit the user height. Two cup holders also help keep your drinks close as you work. Overall, this is a quality treadmill desk that supports equipment of 55 pounds. The Sunny Health Treadmill gives you a large working surface area for easy working as you walk. This is a low profile treadmill made of a large detachable desk to allow use with other standing desks. The desk is sturdy and holds up to 85 pounds. Height of desk can easily be adjusted through the incline buttons to suit each user. The height ranges from 34inches to 52 inches. 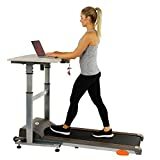 Users can easily detach the treadmill as use a chair to work on the desk. Transport wheels enable easy movement while the digital monitor display allows you to easily track your daily progress. This is a pretty simple design treadmill desk but one with unique features that makes it standout. It has a small working surface area measuring 18 by 40 inches making it best suited for a laptop or mini-top. The desk can be adjusted upright or incline depending on the best working condition for you. Speed ranges for the treadmill start from 0-8MPH giving you options as you work out. The controls are LCD window with an iFit Smart enabled and a 3.0 chp drive system. Users also get USB charging options at the desk to charge their phones with ease. The LifeSpan DT7 is another quality treadmill desk that can bring your workouts from the gym to your home. It comes complete with a desk and a treadmill base. The desk height is easily adjustable to match working conditions. This desk is compact and motorized and an ideal option for any home. It has a powerful but quiet motor that runs efficiently. For easy mobility, it comes with wheels that allow you move it around with ease. Console readouts help you keep track if your daily progression with another free LifeSpan app to sync your data. This is a fully assembled treadmill desk that comes ready to use out of the box. It is compact, lightweight and an ideal choice for homes with limited space. The desk will attach to most treadmills in seconds and easily moves up or down with a simple incline of the treadmill. This way, you can be sure of the most comfortable working positions. Anodized aluminum frames make the treadmill not only durable but also lightweight. It is easy to remove and store when you don’t need to use it. This is only a treadmill but one that can easily fit into any desk at your home saving you money in the long run. Readings of the treadmill are done on a smartphone like LCD screen console helping you track calories, time, steps taken and a lot more. It is small and quite but quite powerful. It comes with six compression shock absorbers and an ultra-quiet 2.5mm rubber belt. This is a treadmill built to last and backed by a three-year warranty. It has a powerful3 Horsepower 4000 RPM DC motor to deliver continuous cycles. This is a compact pick that easily fits under your standing desk and allows you to walk while working. It is a fully assembled treadmill out of the box and ready to use on arrival. It has console readouts to help you track the steps taken, time, calories burned, walking time and distance traveled. You can adjust the speed from the range of 0.4-4 MPH. Other great features include USB port charging area. The frame has a lifetime warranty, the motor a three-year warranty, a two-year warranty on the parts and a one-year labor warranty. This is another simple design treadmill that nicely fits under your standing desks and allows you to work as you walk. 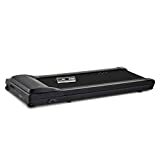 It is an electric motorized treadmill with speed ranges of up to 4MPH and a weight capacity of 250lbs. It has an overall footprint of 65” by 25 inches and height can be adjusted up to 8 inches total. This is a perfect treadmill for staying active by walking when working. The track is quite wide allowing you to walk comfortably. 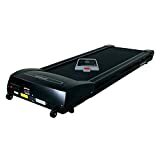 It is a safe product that stops if the treadmill is disconnected from the console. 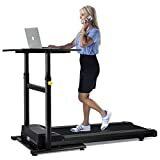 If you’re growing fatter each day because of working while seated most of the time, it is time you get one of these standing treadmills and exercises while working. They are a great product that can keep you fit while also improving your productivity.